When we encourage others, we are making a personal connection. Our hearts are reaching out to their hearts. 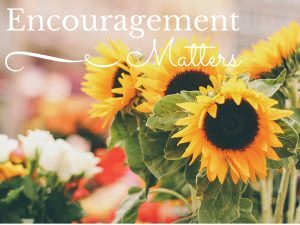 Ultimately, encouragement is the reason we perform, whether we are singing, acting, nursing, teaching or working in any career. We need that connection with others in order to do our best, even if we are by nature solitary. We need the energy and enthusiasm that others bring into our lives, and their applause encourages us to do our best and even better! This is true whether we are at church, volunteering or in business. If it is true for us, and it is true for others as well. It is very important that we encourage those who are under our care and guidance if we want them to succeed as well. I believe that there is much more truth to this story than most of us like to admit. The bottom line is that we are all more likely to succeed when we encourage ourselves, just as we are more likely to fail if we focus on discouraging thoughts. How do you encourage yourself? By positive thinking and self-talk. Stop putting yourself down mentally. Do you tell yourself, “That was a stupid thing to do,” or “You should have known better”? Would you say those things to a co-worker over a simple mistake? I hope the answer is no! We all need encouragement. Sometimes we get to provide it for others or receive it from those we love and trust. In some cases, it is up to us to encourage ourselves!